Oodles of doodles were created by learners in Wales who put pen to paper to raise money for epilepsy sufferers. 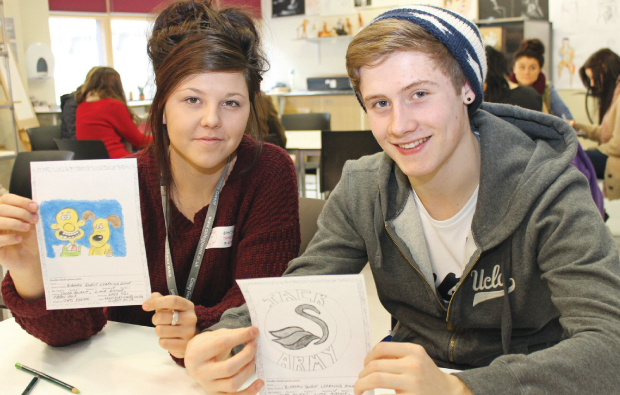 Students at Coleg Gwent raised £70 for Epilepsy Action by taking part in national Doodle Day. Doodlers donated a pound and produced a range of imaginative designs, from patterns and cartoon characters to animal sketches and added them to a sprawling group doodle. Epilepsy affects 600,000 people in the UK, and scribblers across the country, including Sir Ian McKellen, Joanna Lumley, Rita Ora, Tess Daly, Sir Terry Wogan, Mary Berry, Gok Wan, Louis Smith, Lorraine Kelly and Michael Sheen got scrawling for the cause. Students’ designs will be entered into a national competition to win £250 of equipment and resource vouchers, and one doodler will also get a 3D stuffed figure of their doodle.